Travel Cutlery or as we like to call it around here “Everyday Carry Cutlery” is really becoming a valued product thanks to the environmental concerns about plastic. And we here at The Cutlery Review are completely on board with this movement. 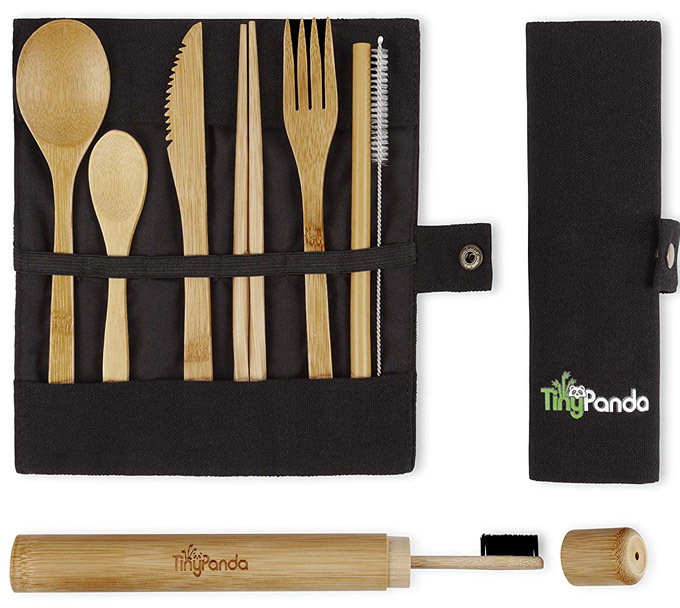 Tiny Panda brings us their rather long named “Bamboo Utensils | Bamboo Travel Cutlery Set | Reusable Utensils With Case | Camping Utensils To-Go | Bamboo Flatware Set | Travel Utensil Set | Eco Friendly Zero Waste Fork Spoon Knife Set”. Yup that’s a mouthful in more ways than one. This portable flatware set includes a fork, knife, spoon, chopsticks, straw and cleaning brush. But wait there’s more! It also includes a bamboo charcoal toothbrush with bamboo case. And if that isn’t enough they snuck another spoon in there for you.